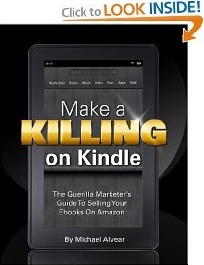 You can't swing a cat without hitting a Kindle marketing article that tells you to use social media to promote your books. Well, that cat needs to be put to sleep. There's one and only one situation in which blogging, Facebook, YouTube, Twitter and other social media can sell books: If you;re already a successful author with a bazillion followers. Before I show you convincing evidence that social media cannot sell an unknown author's book to save its life, I want to clarify a misconception. Despite what you hear, building a social media network isn't easy or fun. I have five blogs (for PDF downloads) and four Twitter and Facebook accounts (for various non-book clients). I also teach blogging workshops. So when I tell you that social media is the most frustrating, time-consuming, energy-sucking, life-draining, stick-a-spoon-up-your-bum experience you can think of, I am saying it from a position of expertise. Unless you're a techie (and how many writers are?) you will go bald from all the hair pulling. You will pay lots of money to strange people who tell you things you don't understand and don't want to know. Blogs are particularly difficult to start and maintain. You don't get a lot of visitors by writing crap. Popular blogs feature well-researched, well-written posts. And that, as every writer knows, takes time. Lots of it. Time you are not getting paid for. And don't buy into the false promise that getting followers to your Facebook, Twitter, Tumblr, and YouTube accounts is easy. Even small companies realize that getting critical mass takes full-time, dedicated employees to make it work. And those companies will be more than glad to tell you that it's almost impossible to sell through social media networks. They're wonderful to achieve communication and brand objectives, but sales? Not so much.